Your DME is optional equipment. It's very helpful, but DME is not actually required for instrument flight. In fact, you should be able to navigate proficiently without the aid of DME, which is only a single unit, and sooner or later it may malfunction. However, on certain instrument approaches there's a critical fix that can only be identified by DME, approaches which can be legally flown only by DME-equipped aircraft. The present flight employs one such approach, and you'll find other VOR/DME approaches in Chapter 5. This is a more-or-less conventional VOR approach, except that DME is required for identifying one intersection, and you should find it relatively easy to do. You'll depart from Gibson City Municipal on runway heading 000°, then turn left to 300° to intercept Roberts R-272, as shown by Figure 4-5. You'll track R-272 outbound, then turn left again at Lexie Intersection, and track R-220 inbound to the VOR. You'll begin your descent at Towin, which is a 5 mile DME fix. The approach will give you an almost-straight-in final to Runway 21. Departure. Take off on Runway 36 and climb out to the north; then turn left to 300°. Level off at 2400 feet. En Route. Intercept Roberts R-272 (on NAV-2, not NAV-1), and track it outbound. Tracking. Keep in mind that you're tracking with NAV-2, not with NAV-1 as you usually do. This is optional, but it leaves NAV-1 set up for the inbound approach, and saves you from having to switch NAV frequencies and bearings later on, when you'll be busy with other things. Turn at Lexie Intersection. NAV-1 is set to Roberts R-220, to identify Lexie. When the needle is about to center, turn left to 220 and track inbound with NAV-1. Setting Up. As soon as you're inbound on R-220, slow down and set up for the approach. Note that Towin Intersection is just 5 nautical miles, or roughly 2 minutes, from Lexie. Descent from Towin. 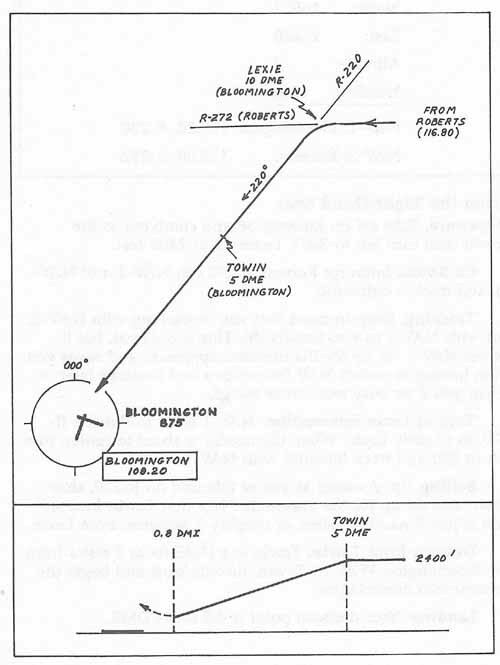 Towin is a DME fix at 5 miles from the Bloomington VOR. At Towin, throttle back and begin the descent into Bloomington. Landing. Your decision point is 0.8 miles DME.